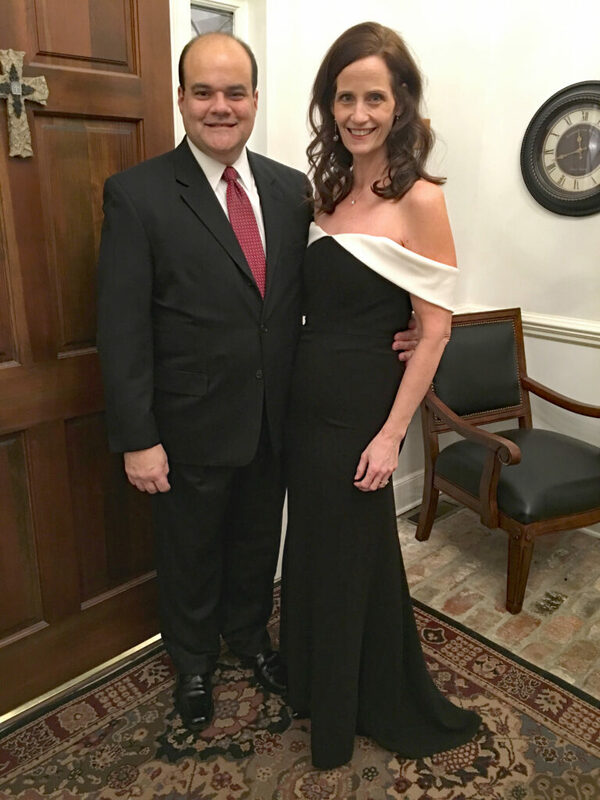 With John before a charity event for the local symphony. Diane Carbonell, author of 150 Pounds Gone Forever,is an advocate for healthy weight loss and healthy family living after having lost over 150 pounds. A homeschooling mom to seven children, Diane lived as a morbidly obese 300-pound woman for 10 long years before taking charge of her health. In 1998, she reached her goal weight and has maintained her weight ever since. During the past years in weight maintenance, Diane has experienced four more pregnancies, an adoption reunion, and several state-to-state moves. A blogger since 2009, Diane works hard on community building, sharing her weight loss expertise with local and national audiences, and raising her family. You can connect with her through her Facebook page, Fit to the Finish or Instagram. Because of Diane’s uniqueness in maintaining her impressive weight loss for a long period of time, Diane has been featured in Shape magazine, Woman’s World magazine, several newspapers, and has appeared on both the Dr. Oz show and the 700 Club. She has been featured on Shape.com’s list of 20 Inspiring Weight Loss Bloggers,and MSN’s FitBie website as one of 10 Weight Loss Bloggers You Should Follow. A small sample of Diane’s media appearances includes a radio interview with FitsMi and Diane’s interview with ABC’s Rebecca Regnier. View her media page here. Diane was the keynote speaker for a Woman’s Health & Fitness Expo in New York and Pennsylvania and speaks at community events, health care events, and gives talks to corporate clients on the benefits of weight loss in the workplace. She authored a weight loss class which she teaches in her spare time. Both Attune Foods and Sabra previously selected Diane to be one of their brand ambassadors. Diane’s message to you is this: “No matter where you are today, you can be somewhere else tomorrow. You can lose any amount of weight that you need to, if you will only take the first step.” Diane’s book goes into great detail about her weight loss experience, gives you practical exercise plans, provides you with 50 recipes, and motivates you to become the healthy person you were meant to be. Legal Disclaimer for the Fit to the Finish Blog and website: This blog is not meant to substitute for any medical advice. This is the story of my own personal weight gain, weight loss, and weight maintenance. You should always take the advice of your doctor and/or medical professional. You should always consult with your doctor before beginning any weight loss or exercise program and never rely on information from this or any website run by a non-medical professional, including this one.